As a self-confessed make-up addict, beauty hoarder and compulsive make-up shopper, I like to think I have a pretty well rounded scope on make-up and beauty brands. And while I often buy high-end and counter brand products, as a Mummy already and with Baby #2 due very soon, this year I’ve really enjoyed getting more acquainted with some of the budget and drugstore brands. I have to admit that in previous years I’ve strayed away from these brands completely so it’s been wonderful to have found some truly amazing products from brands like L’Oreal, Rimmel and many more recently. Not just because it seems that budget brands have hugely upped their game (they have) but also because they now create whole ranges to rival the top-end brands, but at a fraction of the price. And who can afford to turn that down? You can say with absolute certainty that ‘Budget Beauty’ has been transformed in recent years and with the rise of fashion and lifestyle brands who now create a beauty line to accompany their products, there’s more choice than ever before. There’s also a huge amount of options for those who want to spend little but get a lot from our make-up. And I absolutely love that. I wear make-up because I love it. I don’t wear it for anyone else, I wear it because I enjoy playing with it, trying new styles out and I love how it makes me feel. So being able to achieve great results for less, is something I’m really interested in too. Why pay more for a ‘miracle’ product if you truly can get the same results for less. And genuinely in some cases you can – or pretty darn close at least. A brand I’d never tried at all until I started my research, Milani have absolutely blown me away with their high performance products and they are 100% a brand that I think everyone should try. Their products sit in the middle-of-the-road category for pricing, which means they’re affordable quality that make-up lovers will want to try out. Their cult Conceal & Perfect 2-in-1 Foundation and Concealer is one of the best affordable full coverage foundations I’ve tried. I’m completely converted, and absolutely impressed. Finding a foundation that’s truly full coverage on a budget is tough – I know because I’m a full coverage kinda gal and feel like I’ve tried everything. But this has blown me away. I think because it’s a concealer too, so it gives it that bit more coverage ability. It’s a very thick texture but you only need one layer and you’re covered. With coverage that genuinely rivals some of the higher end brands I’ve tried, I can’t recommend it enough, especially at £13. Their Retouch & Erase Concealer (£12) is another one that I highly recommend because it’s a full coverage concealer that blurs imperfections – and it’s not cakey or matted at all. Then there’s the Baked Bronzer (£11) which has a gorgeous pigmentation and would work for all skin tones. In a choice of three shades, with a matching application brush, it’s got the perfect balance of bronzer to highlighter mixed in, so a sweep across the cheekbones is all you need to look sun kissed. And finally, their Metallic Lip Creams are hands down some of the best budget beauty metallic finish lip products I’ve tried to date. On par with the big guys, the pigmentation and durability of these makes them worth every penny and they come in under a tenner too. Another brand I’d not tried much from, but heard good things about was Sleek Make-up. So I knew they were one that I wanted to try out for this, and I’m so glad that I did because their palettes are absolutely amazing value. When it comes to make-up, my favourite will forever be palettes. I’m a sucker for them, especially eyeshadow palettes because who can resist a palette of goodness with lots of beautiful shades to use and enjoy in one? Sleek do amazing eyeshadow palettes, like the I-Divine in Vintage Romance which is a stunning moody and sultry purple palette with 12 shades for only £8.99. A lovely mix of shades to create great smokey eye, it works out at only 74p per shadow – a great way of bulking out your eyeshadow collection without breaking the bank. There’s also their stunning cheek palettes, like the Blush by 3 in Sugar. These £10 palettes are an amazing dupe for the new Anastasia Beverly Hills cheek palettes that have just come out, and the quality is gorgeous. With a mix of shimmery finishes and mattes, there’s a choice of seven to pick from and they’re great for popping in your bag and taking out with you. Both of these palettes – along with the huge range of shades that Sleek offer, mean that make-up addicts can hugely extend their collections with good quality and good performance products for a really great price. One affordable brand that I was really keen to try for this post was Primark. I’ve seen their beauty bits before, especially because my local store has quite a large section dedicated to beauty. But other than the odd nail product, I’d not really tried that much. 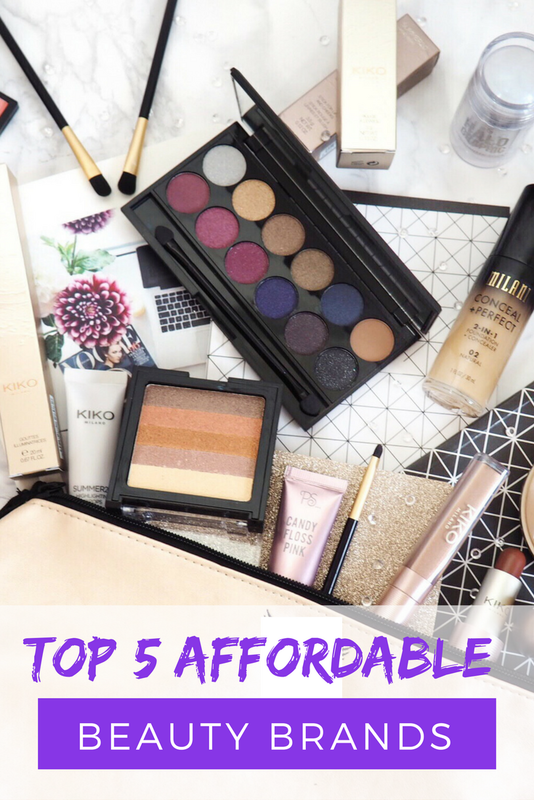 Primark is the affordable beauty brand I recommend the most if your buying decision needs to be based solely on price – because you’re not going to beat their prices. Let’s look at one of their recent collections – dedicated to festival themed make-up. The products start from only £1.50 – which blew me away. Not only that but they were fun and not lacking in the perfect range of products for the festival theme. Showing you really can get on-trend make-up from ‘budget brands’, and there’s no reason to break the bank. The collection features Candy Floss Pink Lip Gloss (£1.50) an 8 pack of shimmer face sticks for only £2 (!) and face gems for £1.50. But my absolute favourites of the collection have to be the Halo Stick – a holographic highlight stick which is an amazing £4 dupe for the MILK range (costing between £20-£30!) and the Unicorn Lipstick which is something top-end brands have been trying to nail this year. And it’s only £1.50, so you can’t go wrong at all. Not only do Primark do on-trend collections, they also have a lovely range of everyday essentials with lipsticks starting from only 80p! One brand I have tried a lot from, and knew from the beginning would be included in this post, was Kiko Milano. Their limited edition collections never cease to impress me and the quality is lovely too. The Summer 2.0 collection is a prime example of why Kiko are a brand that’s needed in make-up bags everywhere. A gorgeous range with everything you need for a summer glow that emphasises all your features, regardless of skin tone. The Highlighting Drops are a favourite from the range, and in a choice of two shades, you can pick which works best for you. Ideal for mixing into foundation for an all over glow, or applying with a beauty sponge across the cheekbones, there are many high-end brands selling products like this for over £20, but the Kiko version comes in at £8.33! Then there’s the pH Lip Enhancer, which is an amazing alternative to the brands who retail their versions for over £20 each. Kiko’s costs £8.33 and offers the same performance – apply to lips and the lipstick works with your skin’s natural pH to go the perfect shade of pink which is great for keeping in your bag on holiday etc as it’s not to heavy and can be worn well around water too. And not forgetting the Lip & Cheek Stick which is a dual purpose stick for only £7.62 and gives lips and cheeks a matching shade of colour. Plus the packaging is absolutely gorgeous and really luxurious looking too. One brand I’d not actually heard of before was Olivia Hale but I’m glad that I got to try out their goodies. Because nothing says affordable beauty more than a range where everything costs 99p – everything! Exclusive to Home Bargains, some of the Olivia Hale products have really impressed me with their performance for the price. They have these amazing Shimmer Bricks which are fantastic dupes for the Bobbi Brown bricks that retail for a LOT more. Plus the pigmentation of the shimmer and the product is lovely – yes, a bit more glittery than shimmery, but the texture is easy to blend and it sits on the skin really lightly without any uncomfortable weight. For less than £3 you can get an entire lip kit – Lipstick, Lip Gloss and matching Lip Liner in a multiple of shades. The reds are a firm favourite of mine, with high pigmentation and strong colour payoff that’s bold and rich looking. You’d never guess you’re wearing 99p products when people see you in them. They also have a stunning shade called Antique Rose which is a beautiful everyday rose pink that’s perfect for all skin tones and has also become a firm favourite of mine. Not only this though, but there’s foundations, primer, mascara, eye liner, nail varnish, bronzer, blusher, and single eyeshadows. And there’s also the Eyebrow Palette and matching pencil which have also blown me away. For less than £1 you get a palette with application brush containing two cream shades to blend, and for someone like me who doesn’t do much to their brows, it’s an absolute bargain way of keeping them looking sharp for less. I mean really – how wrong can you go for that price? Well worth checking out. So these are the top five affordable brands that make-up lovers need in their make-up bags. From the budget beauty end of the spectrum which won’t break a fiver for anything in the entire range, to the more middle-of-the-road budgets, these five brands offer a huge variety of make-up products in a quality that’s great for the price. Their ranges and collections are seriously impressive and between them have worked in successfully convincing me that affordable beauty is something that everyone – even top-end make-up lovers, should be trying. I’d love to hear your thoughts on these products and brands, and about any others you highly recommend for affordable beauty!